This is a bento I made last week from leftover tonkatsu. I’m calling this pork cutlet though because I didn’t have enough panko to double batter this one and it was a very thin piece. The rice went in first, then I put the cut pieces on top, with some of the extra ones filling up the underneath to elevate the cutlet up. 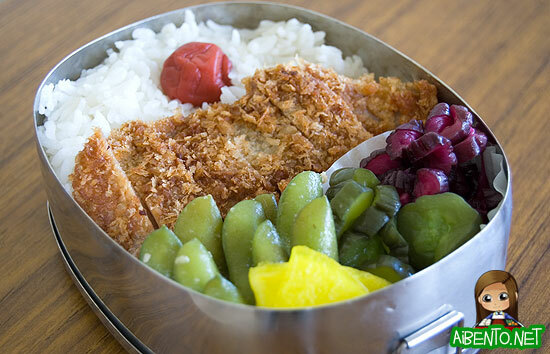 Packing a bento very quickly is very easy if you buy a bunch of pickled veggies to store in your fridge. For instance, I keep containers of the purple eggplant pickles, cucumber pickles, takuan (the yellow stuff), and some garlic edamame from Foodland. With ready made sides like these you could technically pack a bento like this in five minutes, as long as you’re using leftovers. For red, I simply used a nice fat ume. I’ve been really falling behind with Learn 2 Cook, but have been doing a lot of posting on Fictional Food, which has been getting nice hits lately for my work on The Hunger Games. I’m hoping to get to things like Lord of the Rings and Harry Potter as well. If you haven’t had a chance to check out the site yet, please do!